Ingredients: Noodles (70%): Wheat Flour, Salt, Water. Sesame Sauce Pack (14%): White Sesame Seeds, Canola Oil. 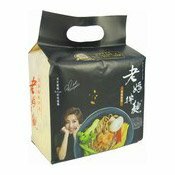 Pepper Pack (2%): Pepper, Flavour Enhancer (E621).